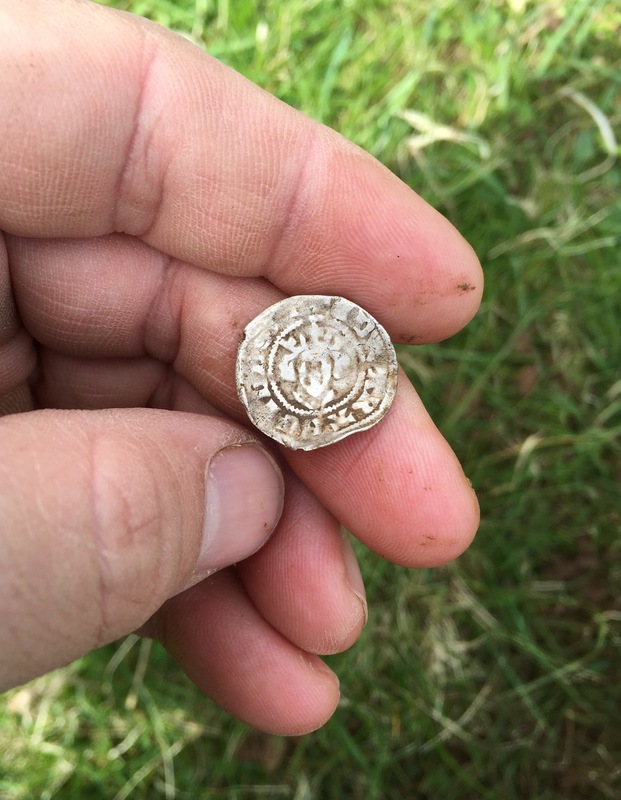 Today I drove to Bucks to meet with the Guru himself, the man made justly famous by the most helpful Deus videos on YouTube, Gary off of Gary’s Detecting. I’d arranged to meet with him for a four-hour, one-to-one training session on the Deus. As ziggyjinx put it on Gary’s forum, ‘You spend over a thousand pound on a great machine so for the small price of his one on one training session you will get the max out of the deus and unlock it’s full potential’. I couldn’t agree more. 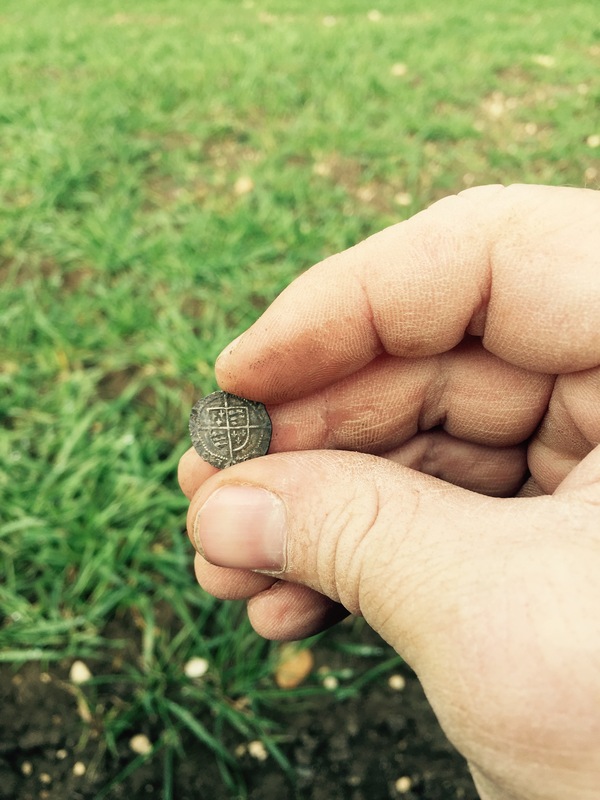 Gaz welcomed me into his home and over a cuppa we discussed where I was with my detecting — two years in the hobby, but only one month with the Deus — and where I wanted to go. 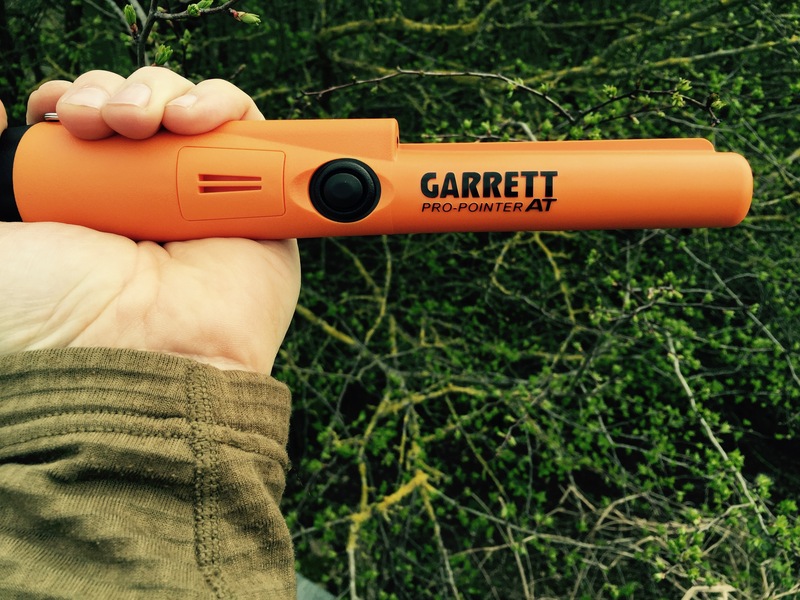 Gaz showed me an interview he’d just shot for the XP blog: one of the hoard-finder ones that always make my cerebellum tingle and my hand itch for the handle of my detector. 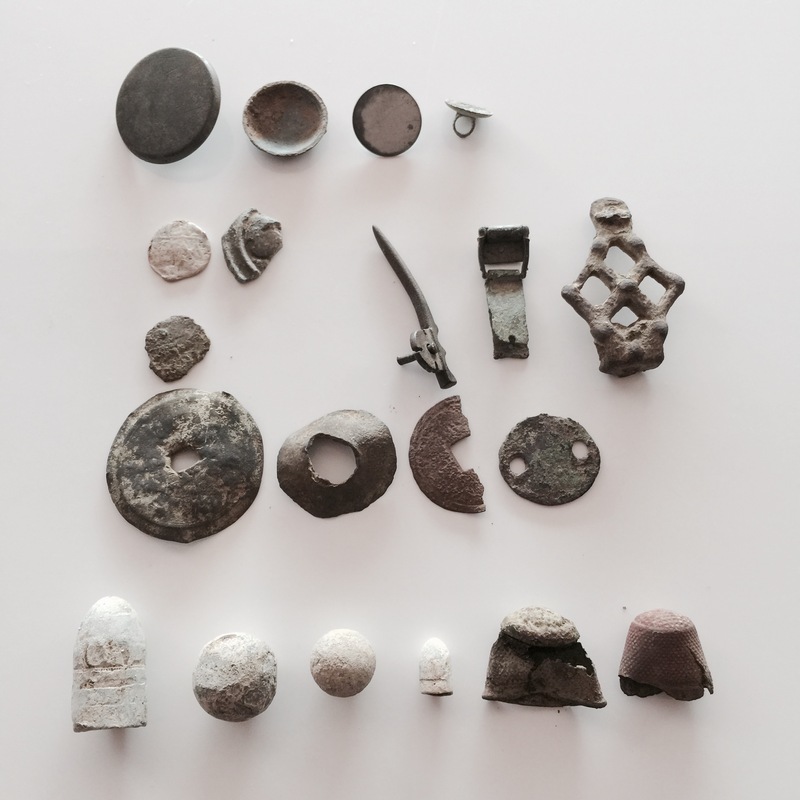 Then he let me have a crack at the test garden he’d made up, including the buried hoard. 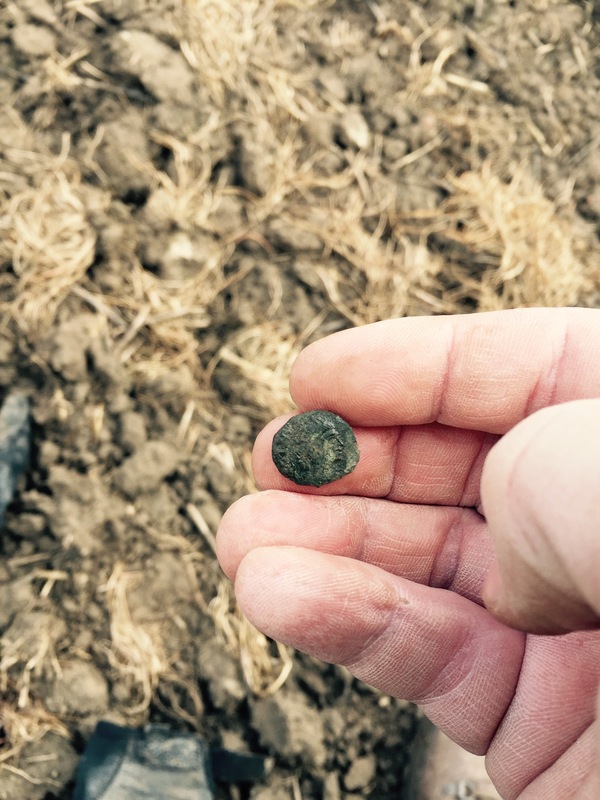 My 13″ coil did ‘find’ the hoard, I suppose, but I knew it was there; I’m not sure I would have dug it on my own in the field. 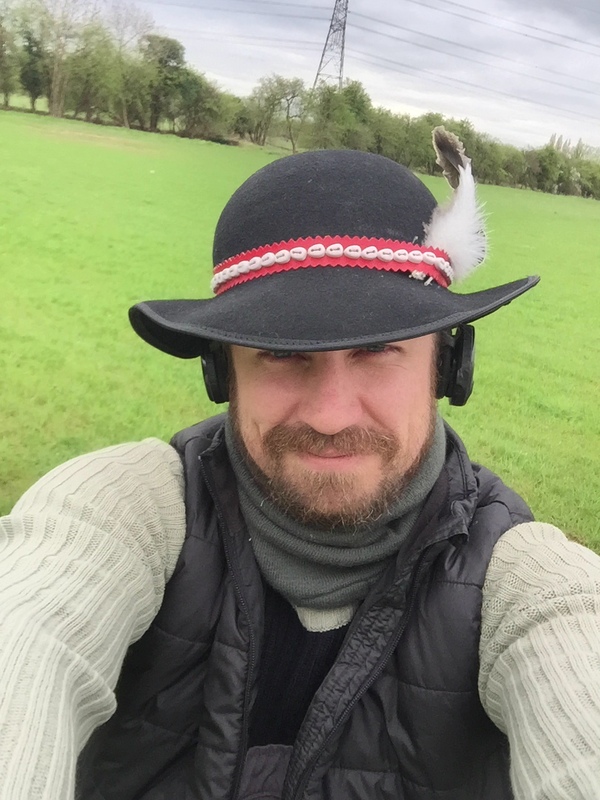 Gaz says some days it’s findable and other days not; depends on atmospherics and soil conditions and angle of attack — and probably on luck too. We worked through the heavily iron-infested test garden so I could get my ear in, and Gaz quickly punctured some of my mistaken concepts about depth — not just with the Deus but with all detectors. 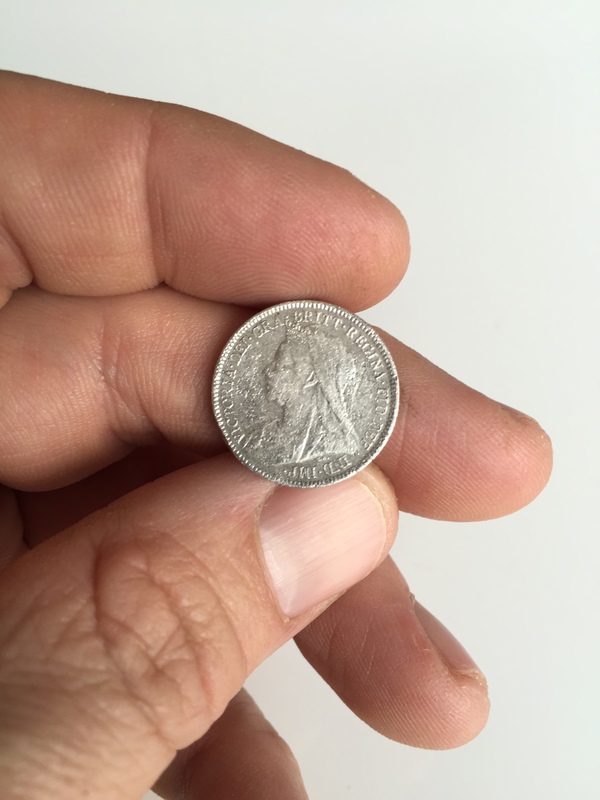 He also pointed out the problems caused by wonky coin orientations, on-edge for example. 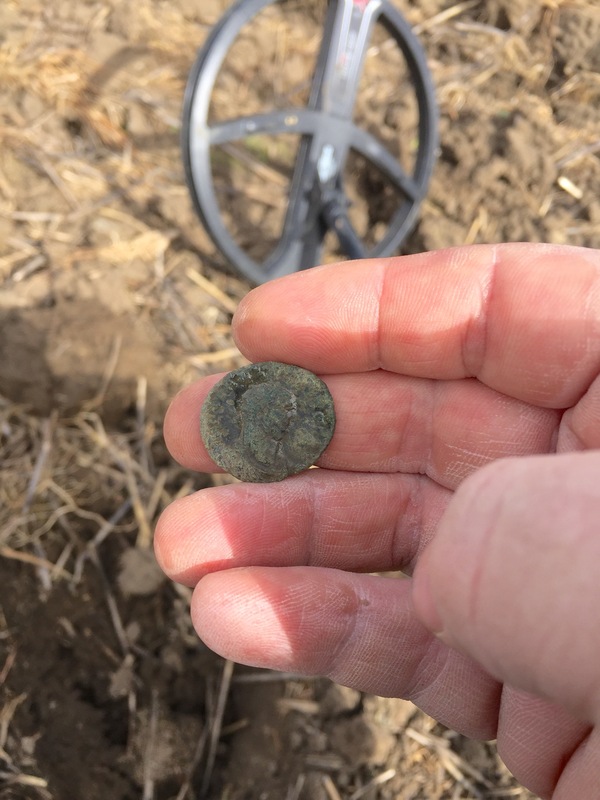 You might think I was disappointed to learn that in some tricky soils and junky conditions, even the Deus just won’t penetrate that deep into the ground. I wasn’t. The reason I went to Gary was so that I could begin to be confident that if something detectable passed under my coil, that my Deus would get it and I would know how to interpret the information the detector was giving me. I have that confidence to a much greater degree now, and it is based at least partly on the fact that I know better what to expect from my machine — what it can do, and equally importantly, what it can’t. And as you Deus users out there know, it can do a hell of a lot. 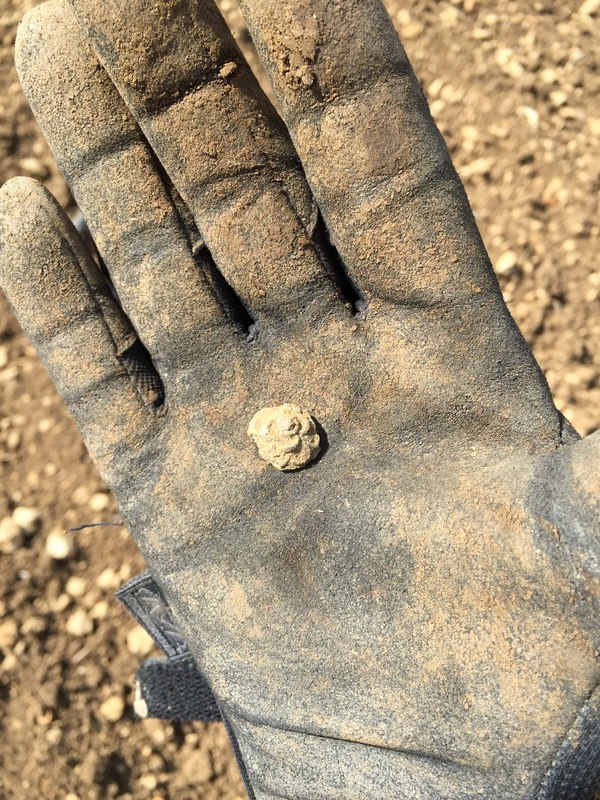 I got to keep the hammy as a memento of the dig (Gaz pointed out that if I’d found anything truly spectacular, we’d have divvied it between us and the farmer). 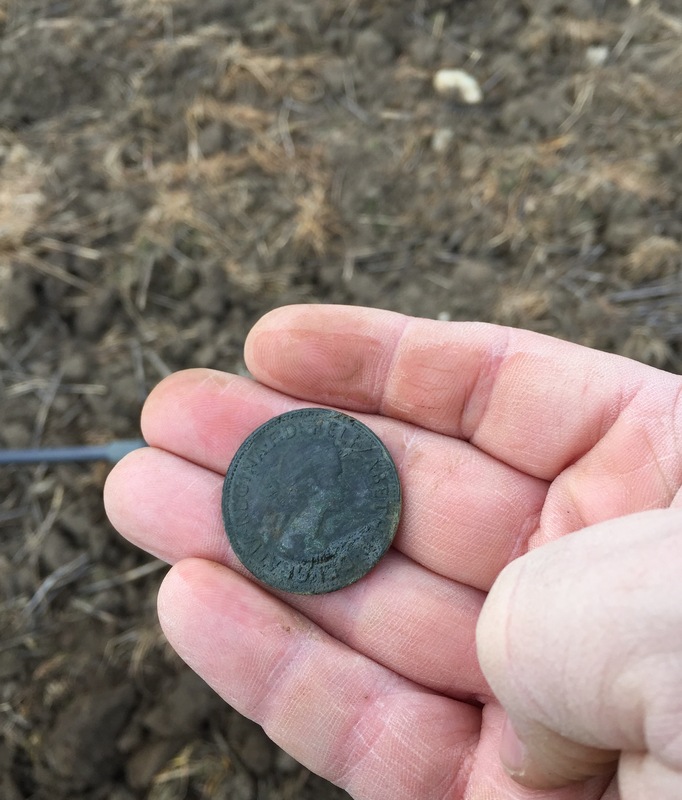 The day would have been brilliant, and a phenomenal value, even if I’d found nothing whatsoever, because I was able to develop that little bit of extra confidence that can make all the difference to your finds rate. 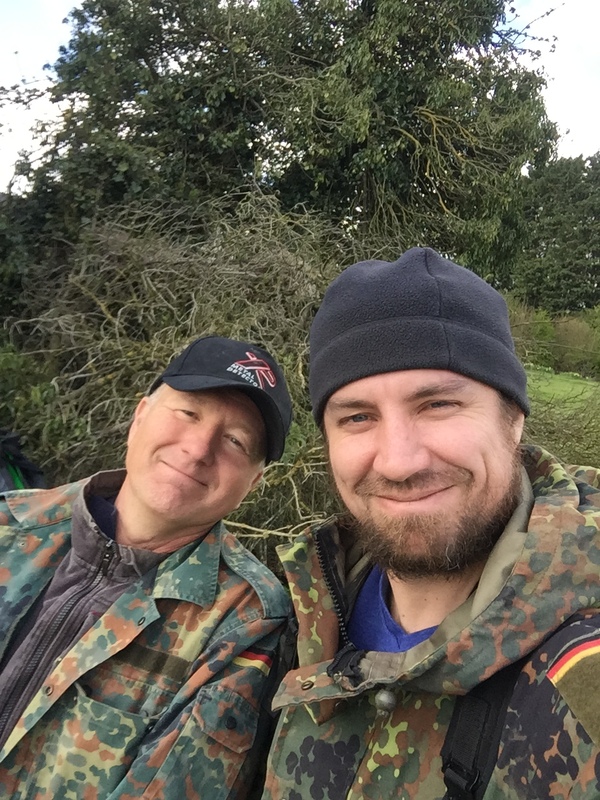 When we’d spent a good three hours working and talking through set-ups on the field, we returned to Gaz’s place for another cuppa and an after-action review. From my time in Forces I recognised Gary’s to be an ideal training methodology: Prepare; Teach; Train; Revise (and Reinforce). Gaz cleared up any remaining questions I had and gave me a booklet he’d written covering and reinforcing many of the topics and tricks we’d gone over together. As we parted he invited me to contact him anytime if I had further questions and encouraged me to continue participating in the forum. I had a great time; Gaz is a friendly bloke and a gifted teacher. His course would have been a steal at twice the price. I guess I can sum up my advice like this: if you’re thinking about doing a training session, go for it. 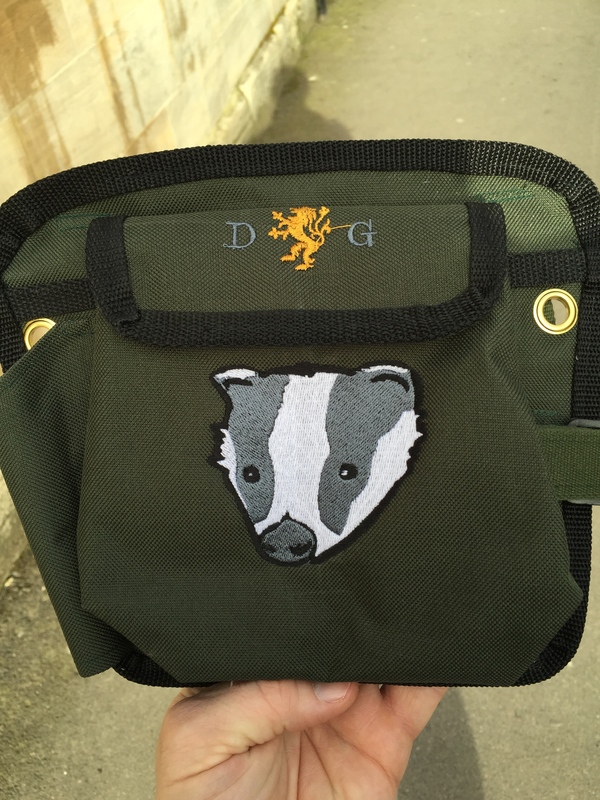 It will be the best ‘accessory’ you purchase for your Deus, and the one best calculated to help you get the most from your machine. 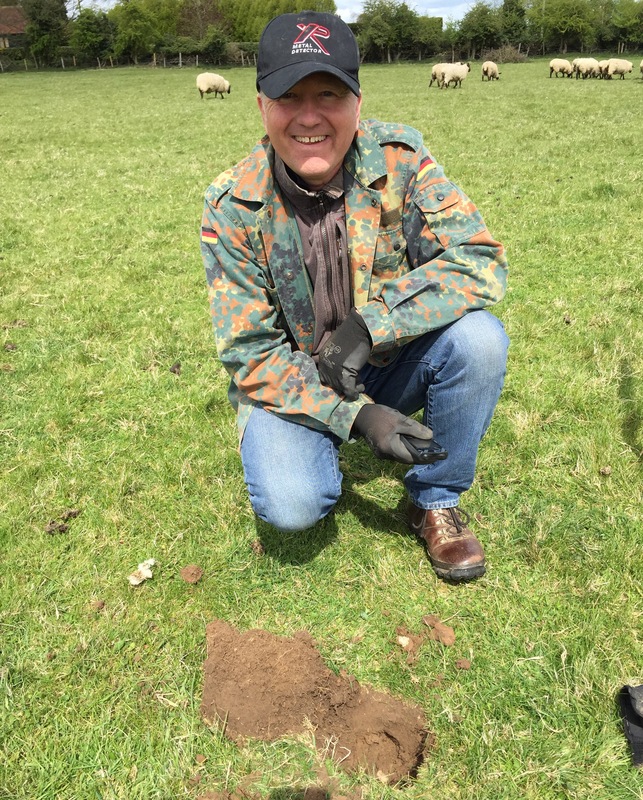 Attended a club dig today on a large manor pasture site with an airstrip running through it. 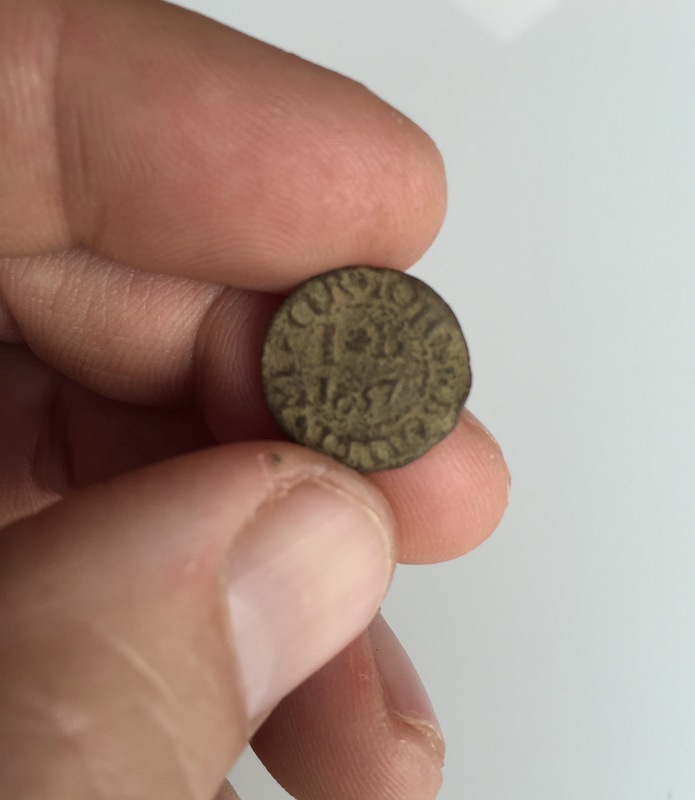 Mike had a lovely Edward IV groat, using his modified Deus Fast program (2 tones; freq. usually to 12 though down to 8 on Sunday because of targets deep in pasture). 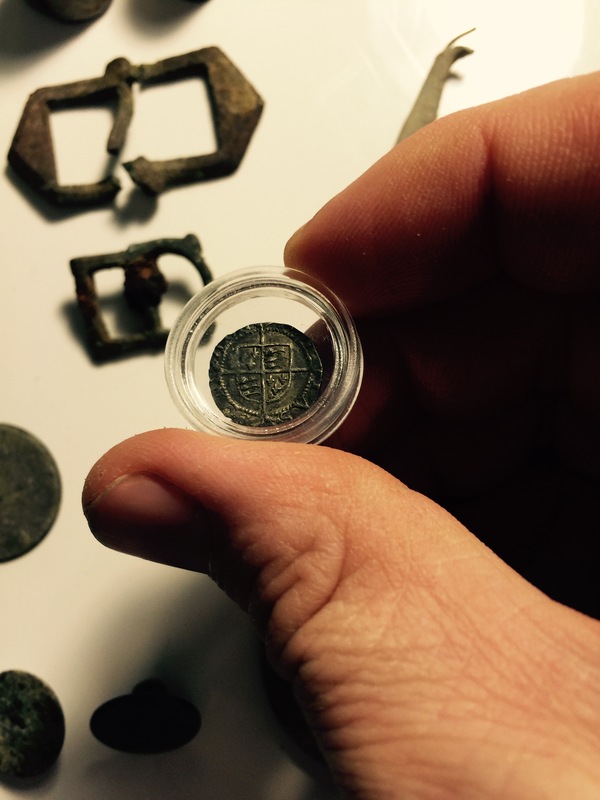 Kevin had a nice Roman. 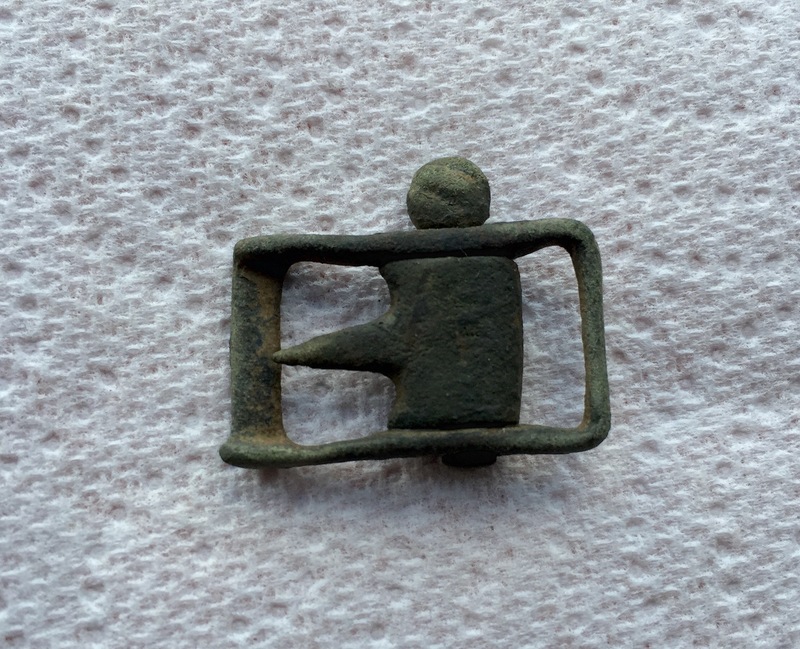 I found this buckle and a bronze ring; also a ferule-type object. I called it a day fairly early, as I was still tired from larking the day before, and I was scheduled to see The Avengers: Age of Ultron with friends in the evening. 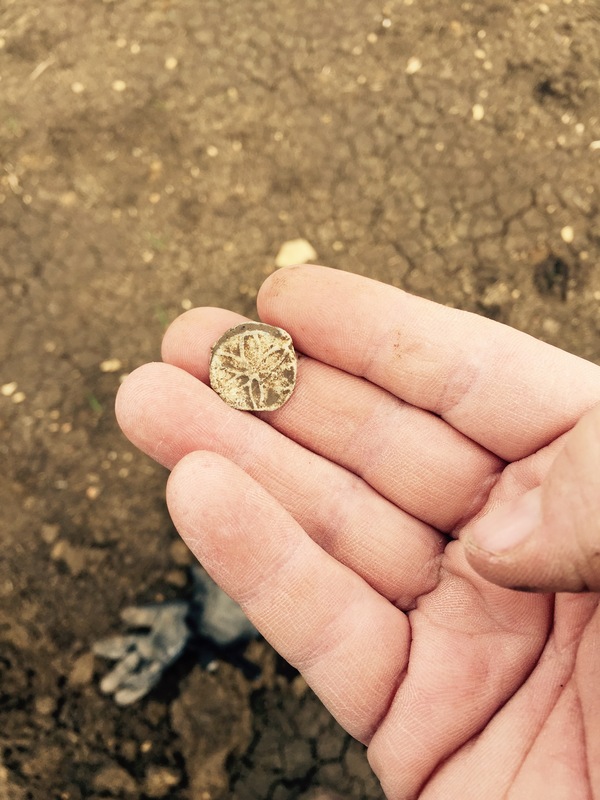 Incidentally, the lads at the club enjoyed seeing the mudlarking finds prior to the dig. Many of them are fans of the show. We had a massive ploughed field as a club today, but not much came up. 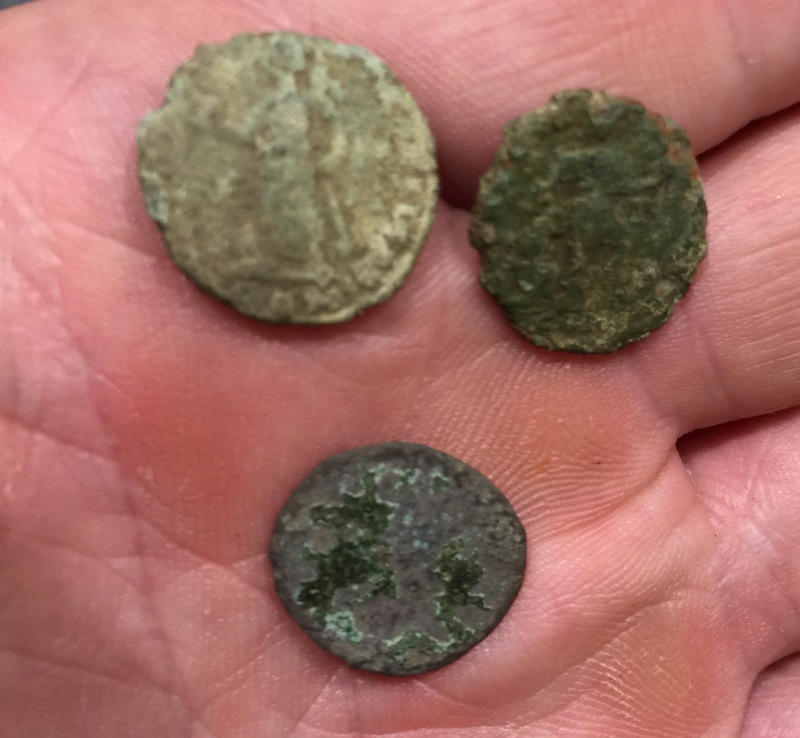 I had arguably the best outing with a milled silver sixpence of Victoria (1901), and a local trade token from an Oxford mercer, or cloth merchant (1657). 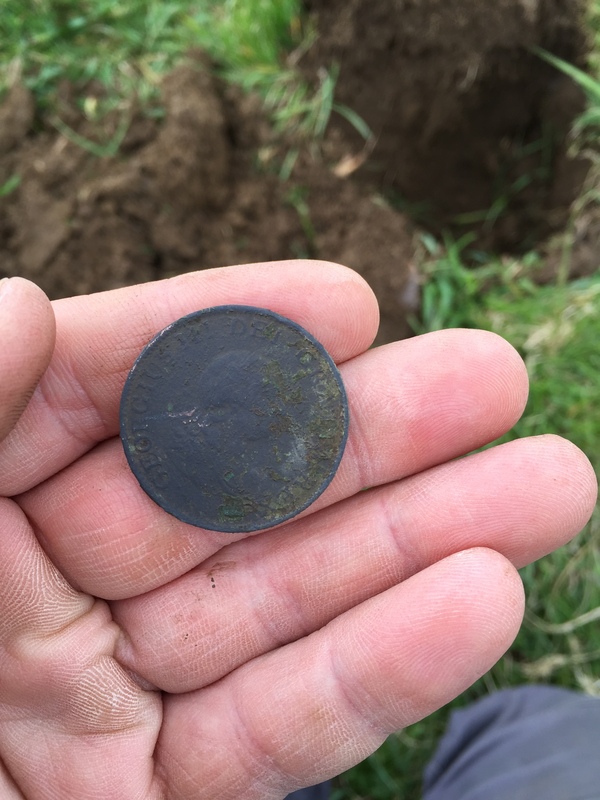 The pics below show the silver out of the ground and cleaned up. Ulmo has just been ploughed, and as most the other fields are under crops, I thought I’d take a try before it begins growing. 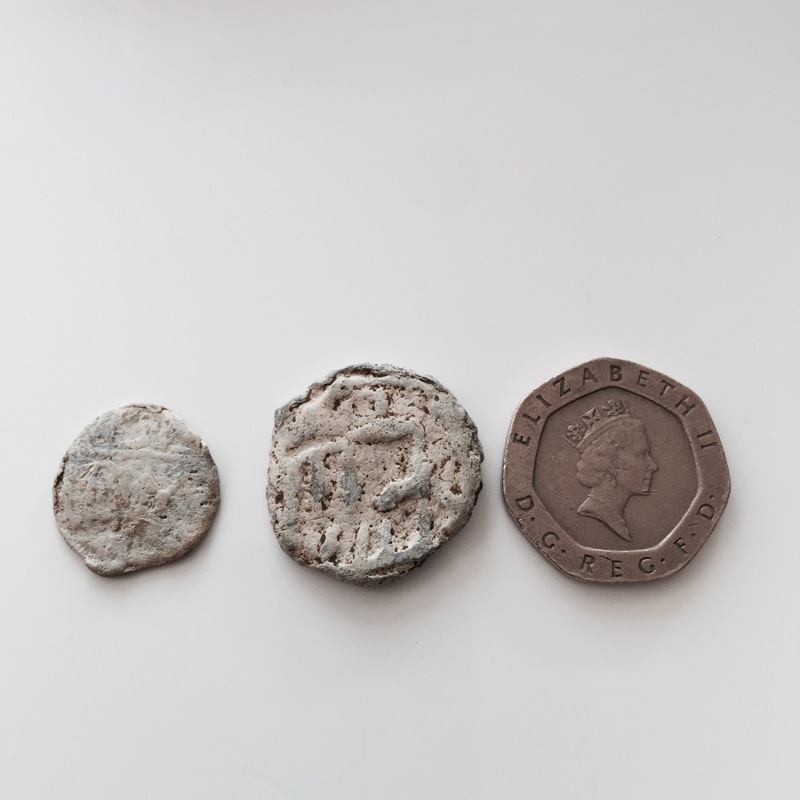 I managed to turn up two Romans, one of which was damaged but with a nice portrait, with the other illegible. 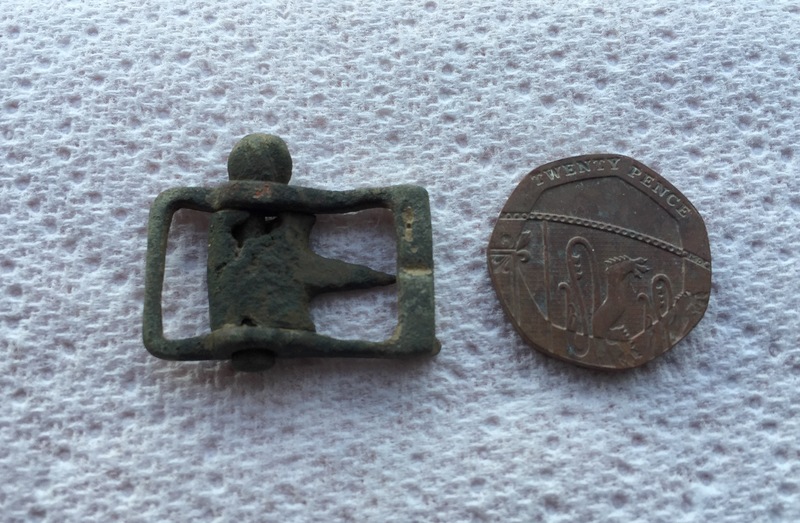 I also found a bit of medieval buckle and an as-yet unidentified object. 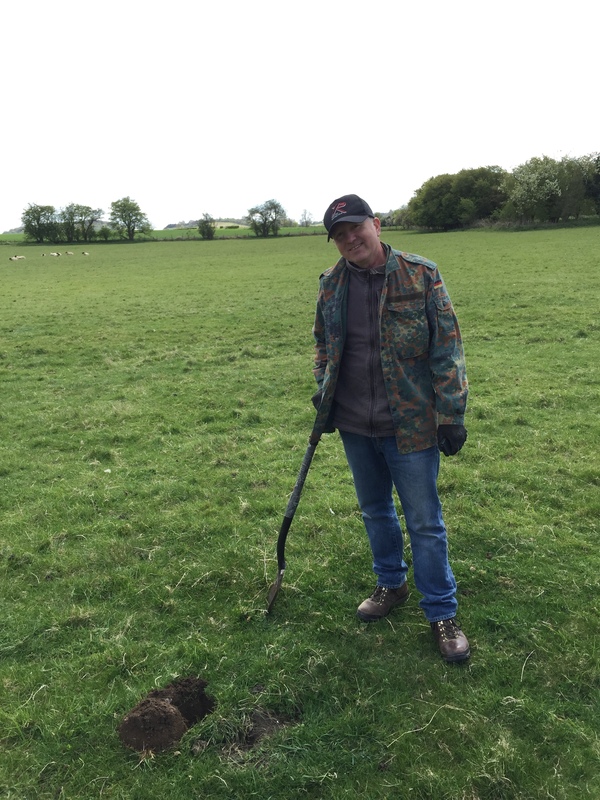 I joined an OBMDC dig today on Cumnor pastureland, although I was (and remain) skeptical of the fecundity of the site. 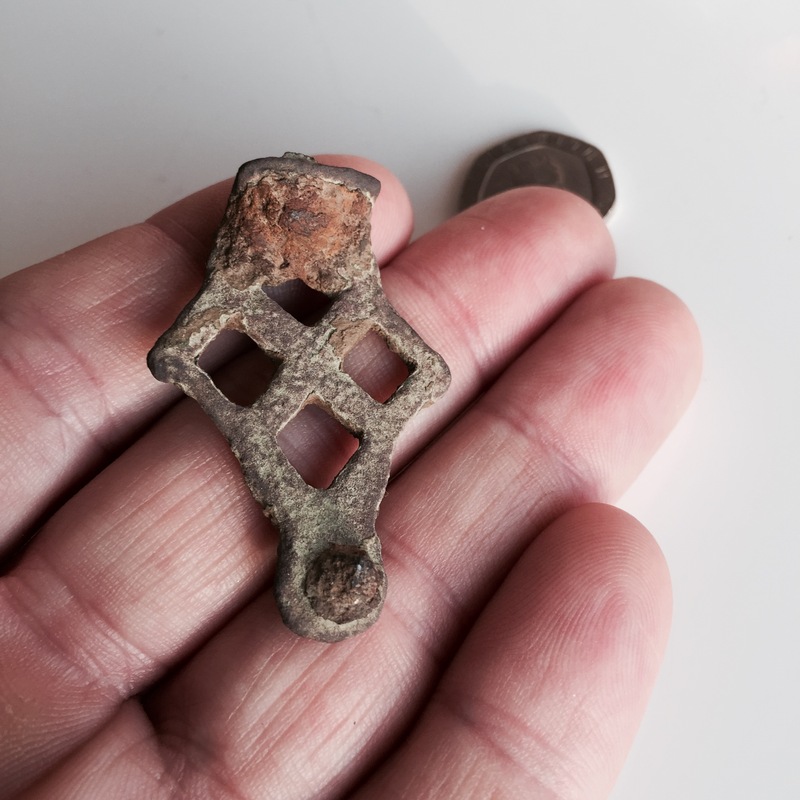 It’s not that no archaeology is to be found there, but rather that clubs have been on the land for so many years that it has mainly been picked over. The farmer himself told me that nobody finds much. 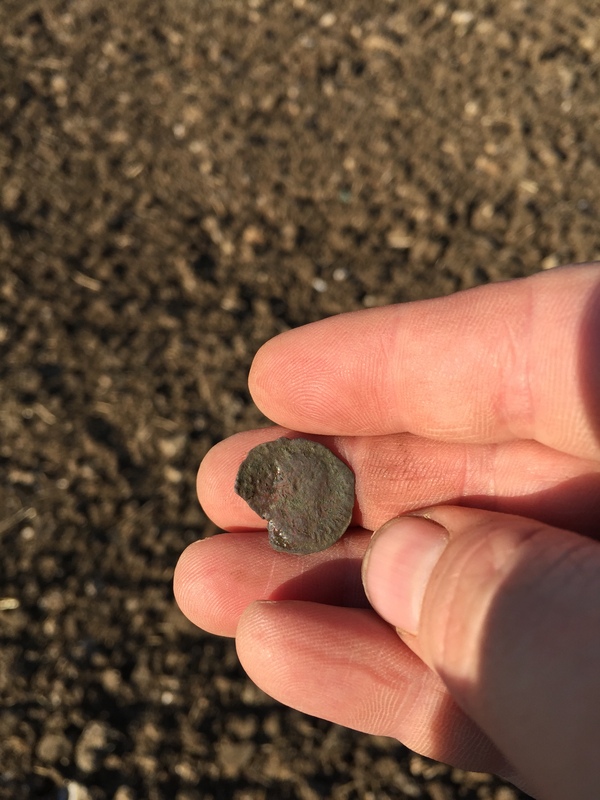 Using the techniques gleaned from Gary’s tips about detecting deep signals, I chased a few phantom targets, managing to turn up a toasted Roman nummus (as far as I know, the only one found on the day). 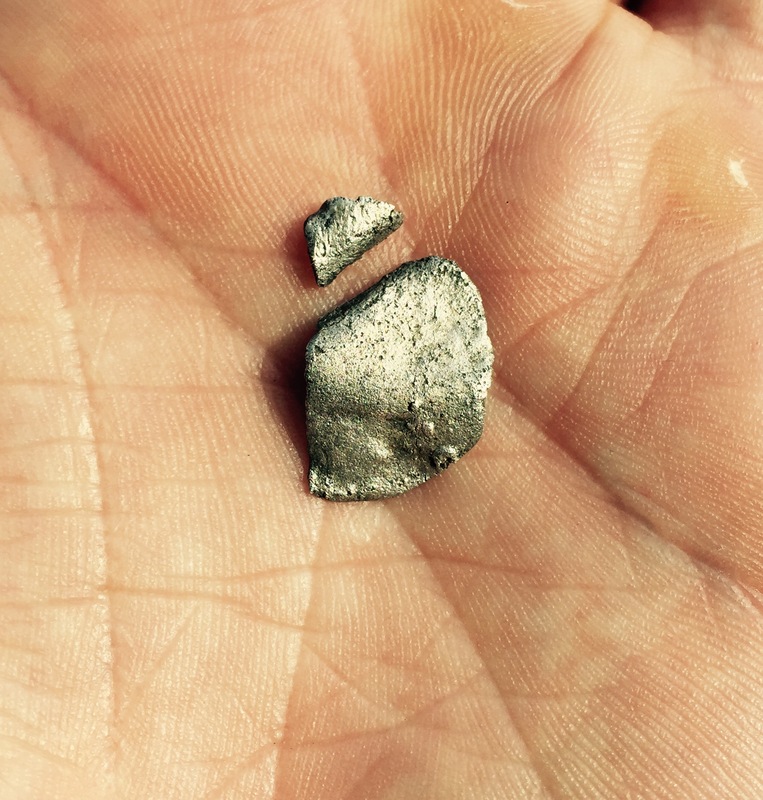 The aluminum button in the pic above had my heart racing, as it looked entirely like silver in the hole. 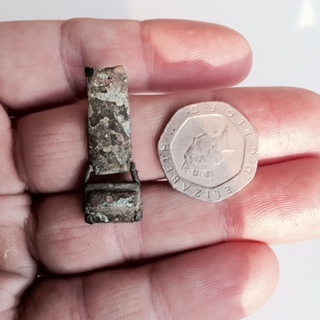 I also found a bit of beaten-up thimble, part of a fibula brooch (? 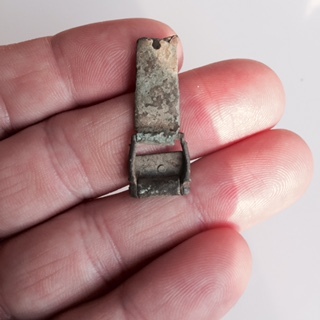 ), a detailed lead strip, and a button head (see pic above). 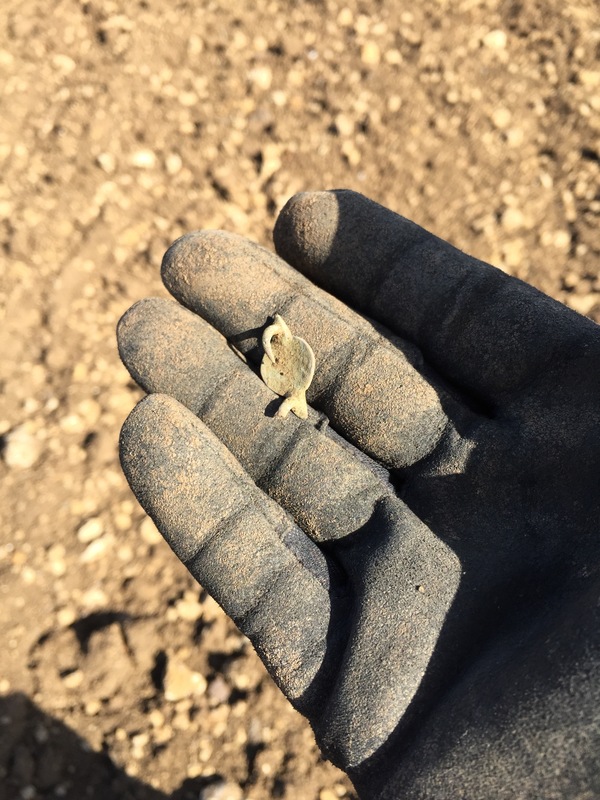 When I left the dig, I went straight to my P, as I was itching to find something. I guess I’ve been spoiled by the richness of my sites over the last couple of weeks. I had an appointment in the afternoon, so I only had about forty-five minutes to detect; I figured the easiest spot would be on Reedy. 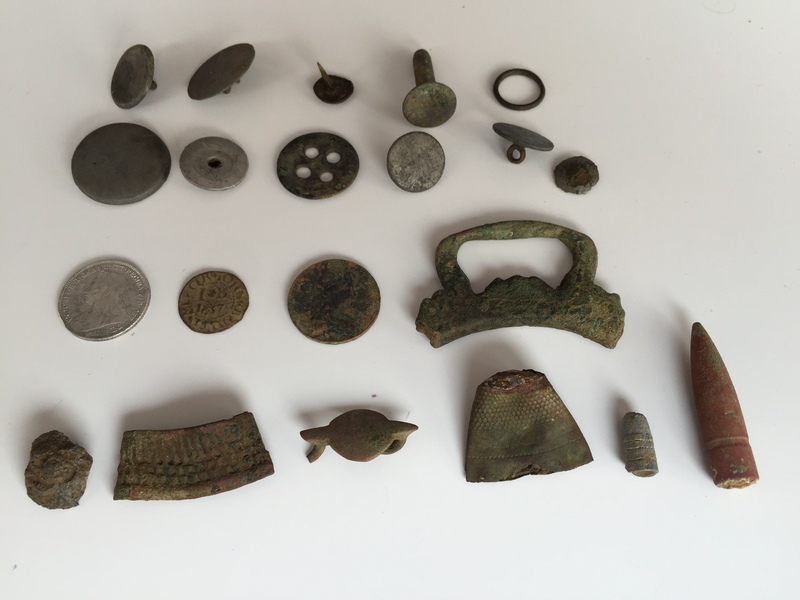 All I found was a treacherous gold-looking button with a costume jewel set in it; some other buttons; and a couple of knackered coins. 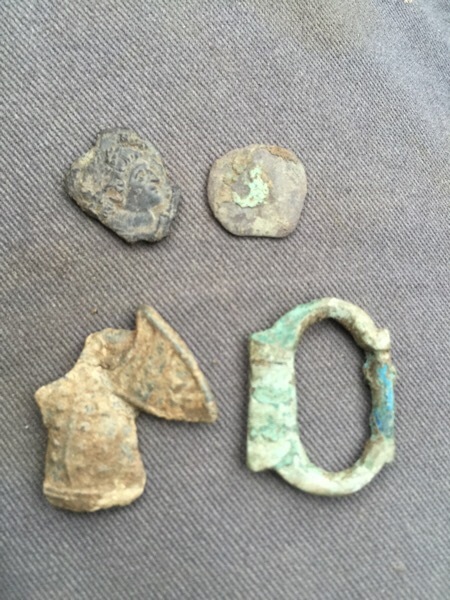 I still wasn’t satisfied, so after my meeting I returned to my P, this time on the lower part of Noah, a field obviously rich in medieval and Renaissance finds. 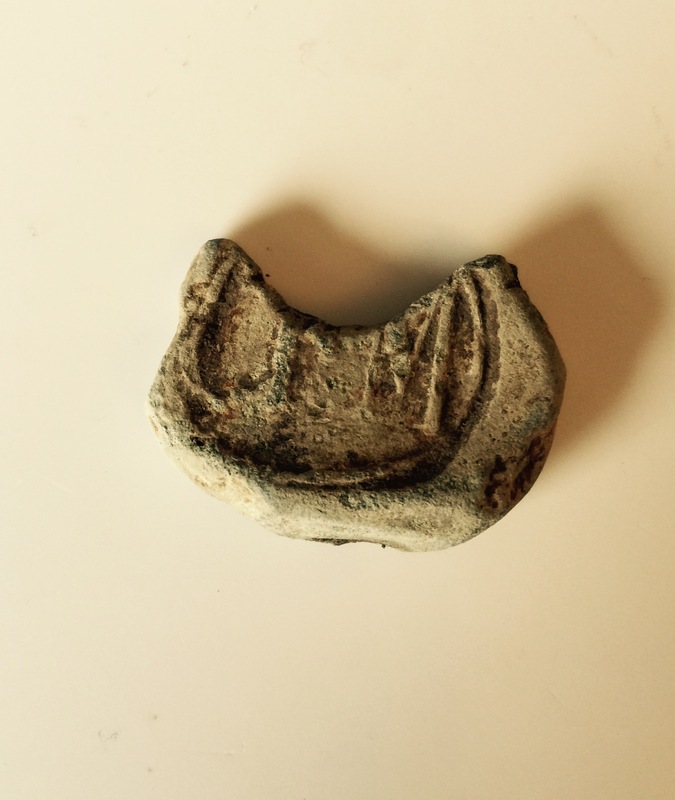 In short order I found various bits of lead, including a couple of bag seals (one engraved with ‘DiXON’), a weight, and a token (see pic below). 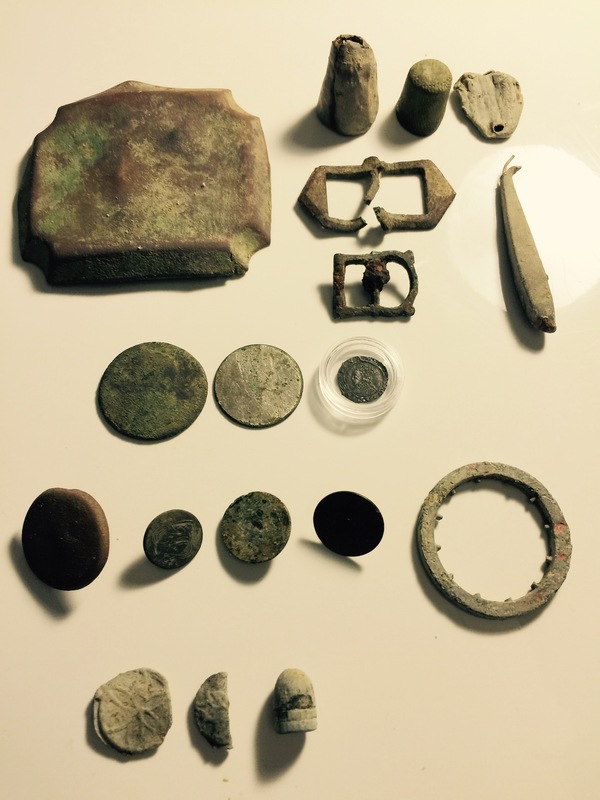 I also found some sort of copper plate, some bits of buckle, medieval pins, a casket key, a bit of coin, and a penny (? 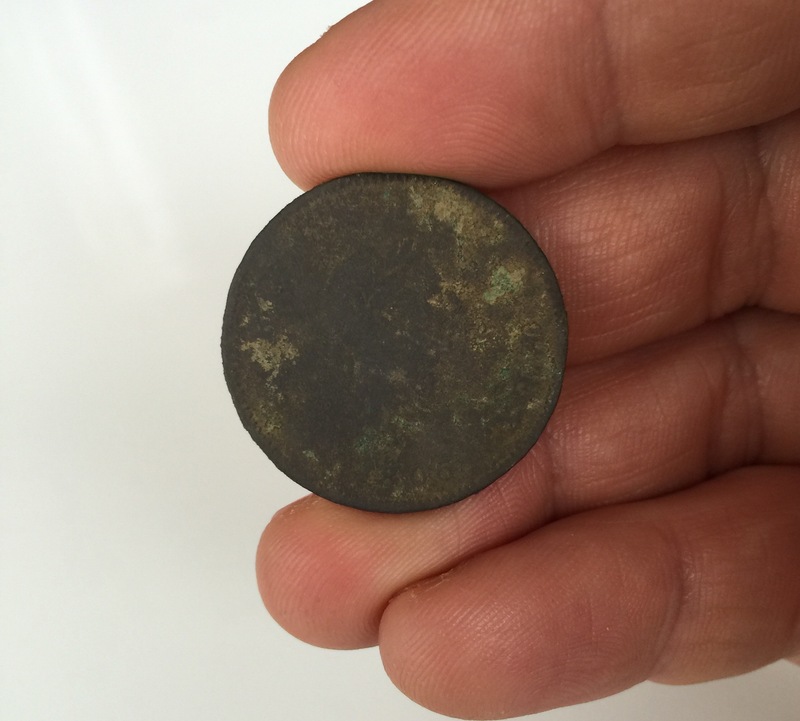 ), badly beaten but with the date, 1701, and the legend ‘GUILLEL[…]’ visible; William III, therefore. 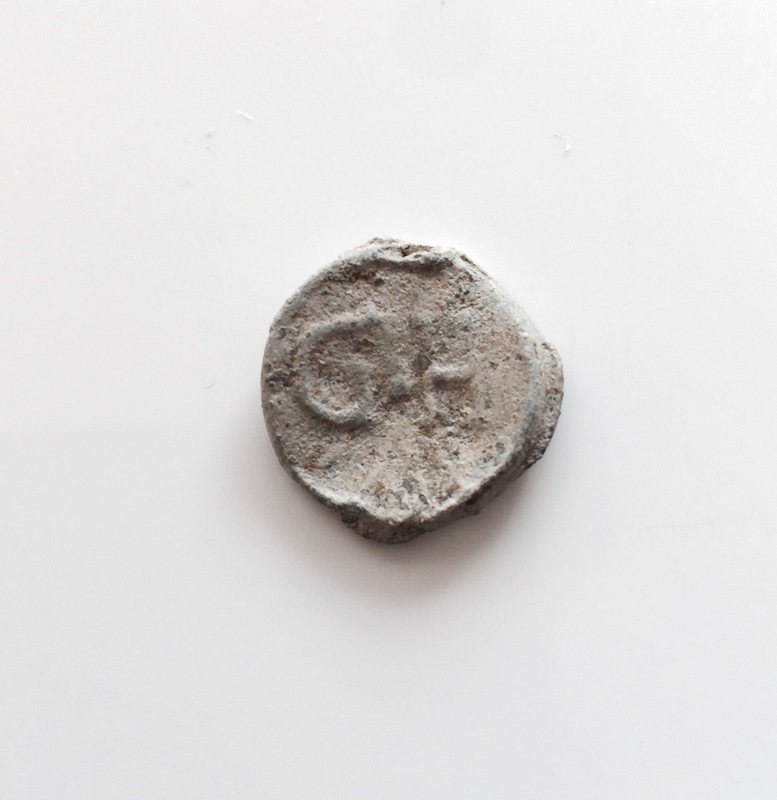 This lead token or tally was interesting, as it was the third I’ve found on Noah (I found two on 2 April; one of them was folded in half). All in all, it was a successful day. 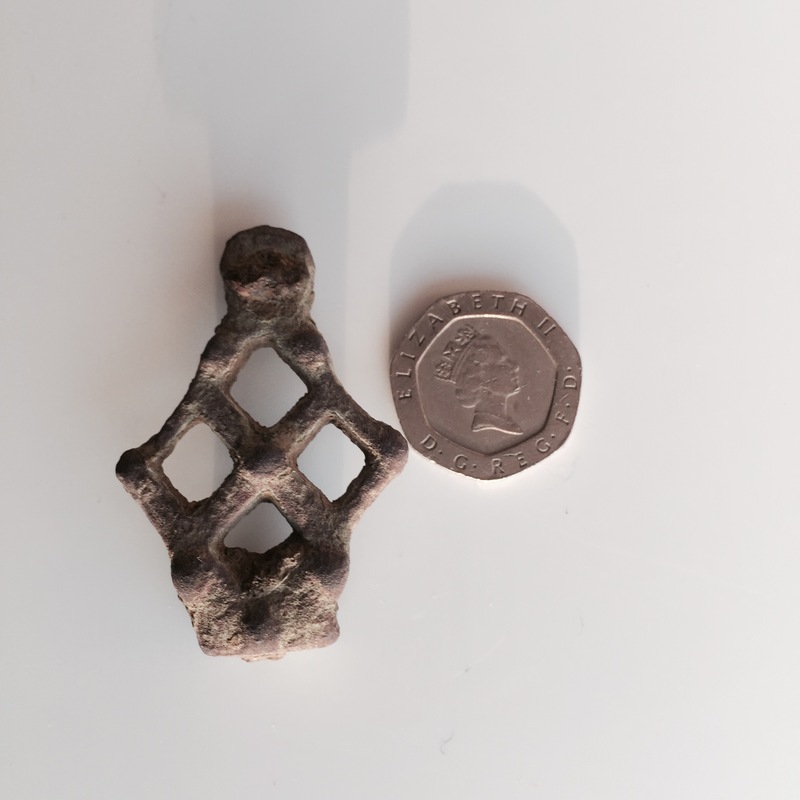 I didn’t have the spectacular find I obsessively sought, but I did uncover some nice artefacts, and I confirmed that Noah is and will be a field of importance for its medieval provenance. 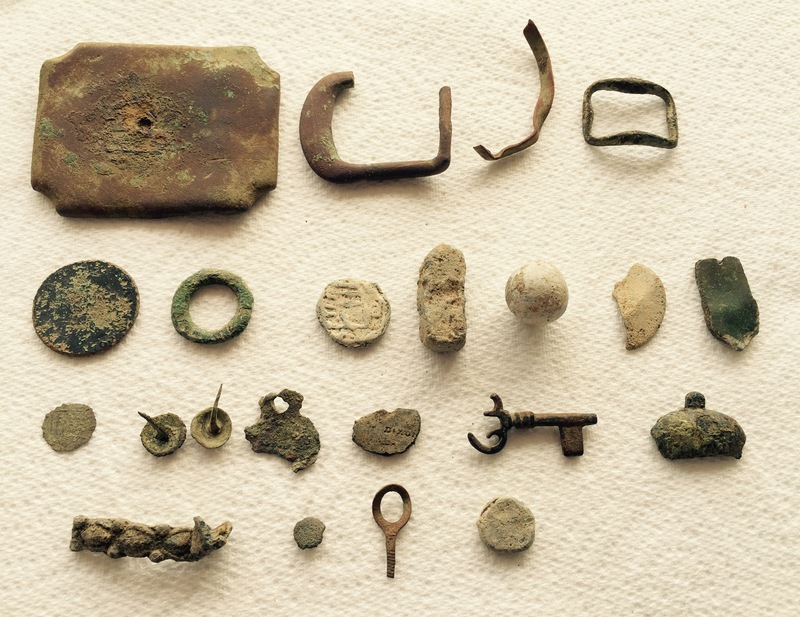 Spent the day taking in the spring sunshine with a friend: picnicking, tramping through the fields, and of course, detecting. I had hoped to replicate recent success in ‘Roman Alley’, showing off the capabilities of the Deus, but signals were few and far between there. 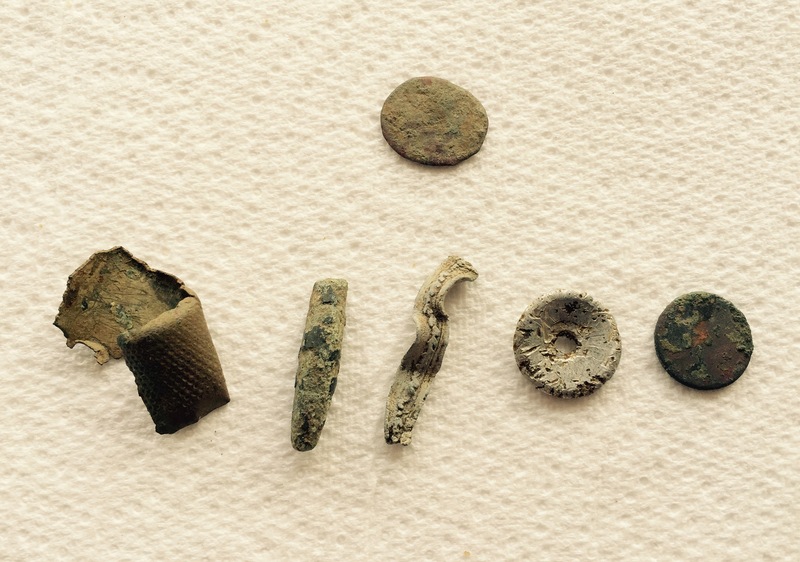 I’m not sure whether my settings were poor, or whether I’ve picked clean most of the easy Roman targets. 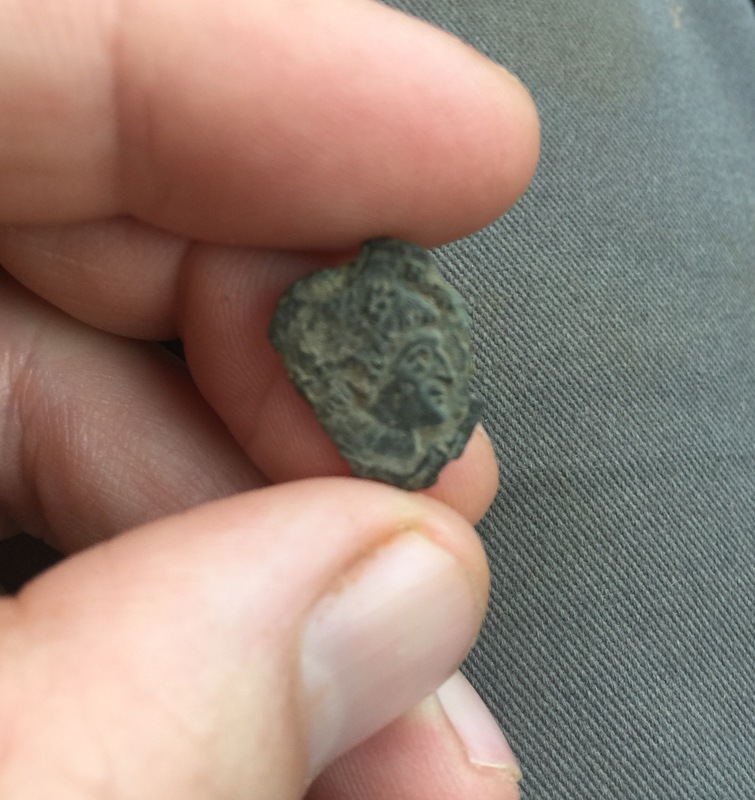 It was two hours before I found one grotty nummus (outlines of the portrait barely visible) in a corner of the field I hadn’t searched earlier. 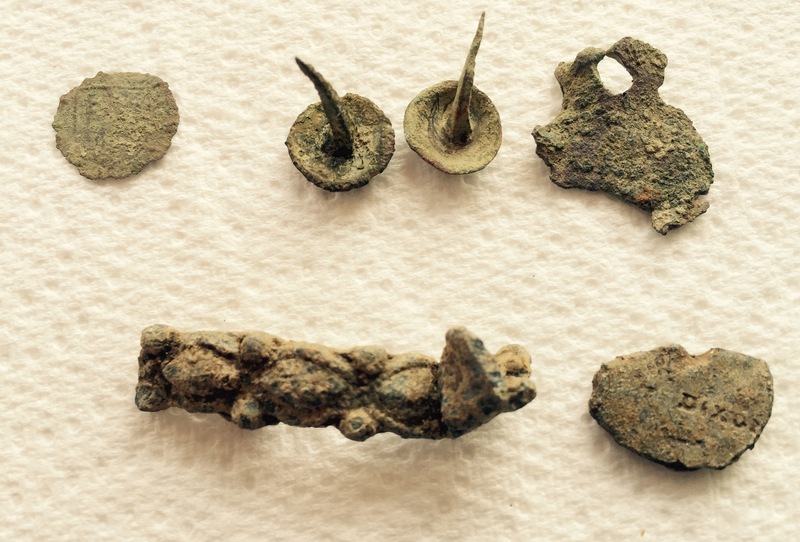 I kept two nails because of their location on the Roman field, along with a lead weight with a suspension loop, a large bag seal (or possibly a token), some buttons, and a fragment of a silver coin with no extant image. We shifted to Oscar Wilde to relax in the soft grass and hopefully improve the finds rate. 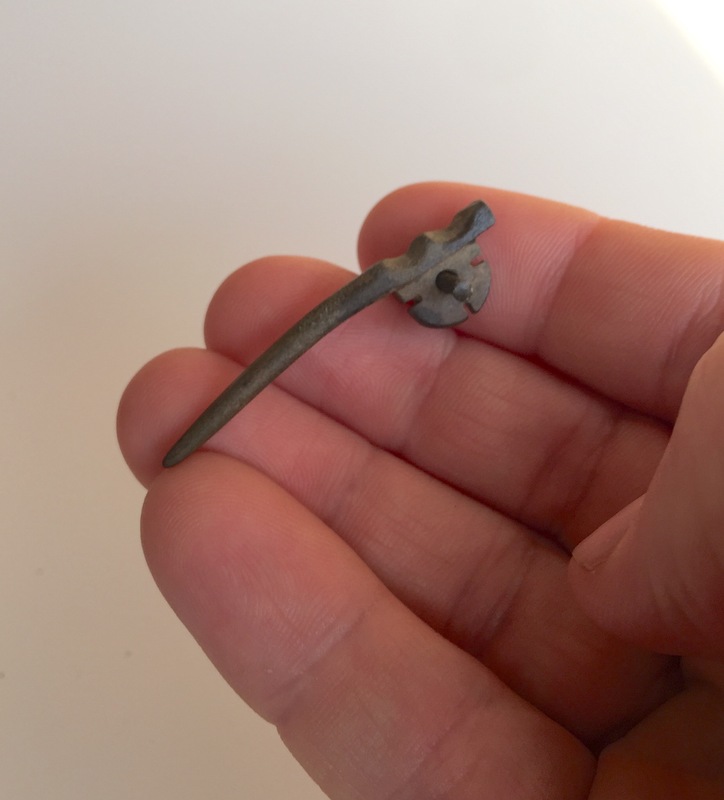 I did find another Roman, but it was as badly knackered as the first. 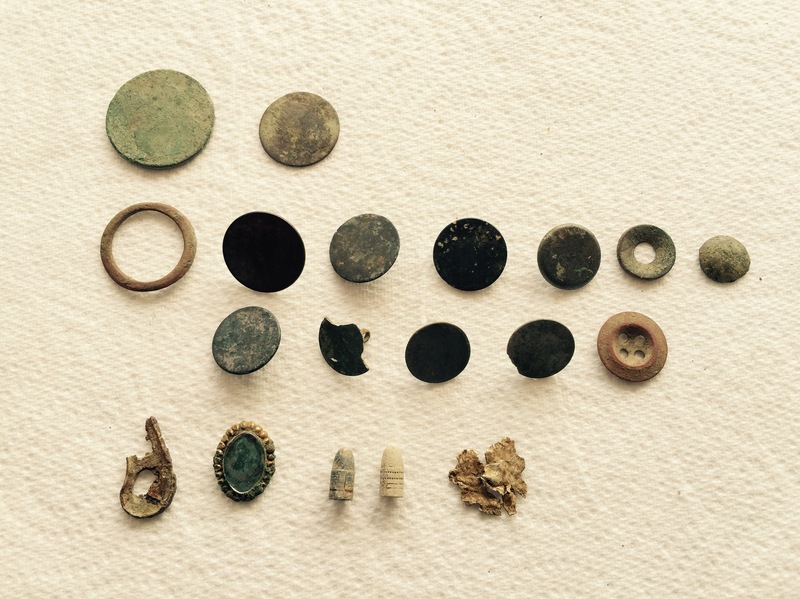 I also spent about twenty minutes digging for a hoard; got to the point of believing I had found one. I was shaking and feeling giddy, as even the Deus audio-discrim pinpoint feature was whining upwards as I approached the bottom of the hole with the coil. 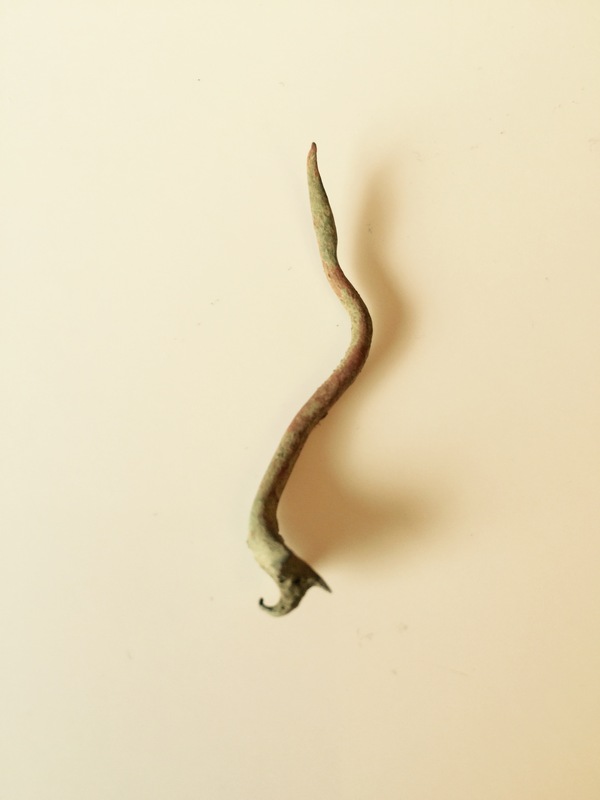 In the end, though, it turn out to be a skein of rusted barbed wire buried about two feet down. Argh! I craved a break from thesis matters, so I rushed off at 5:30 pm for a late-evening hunt on Noah. 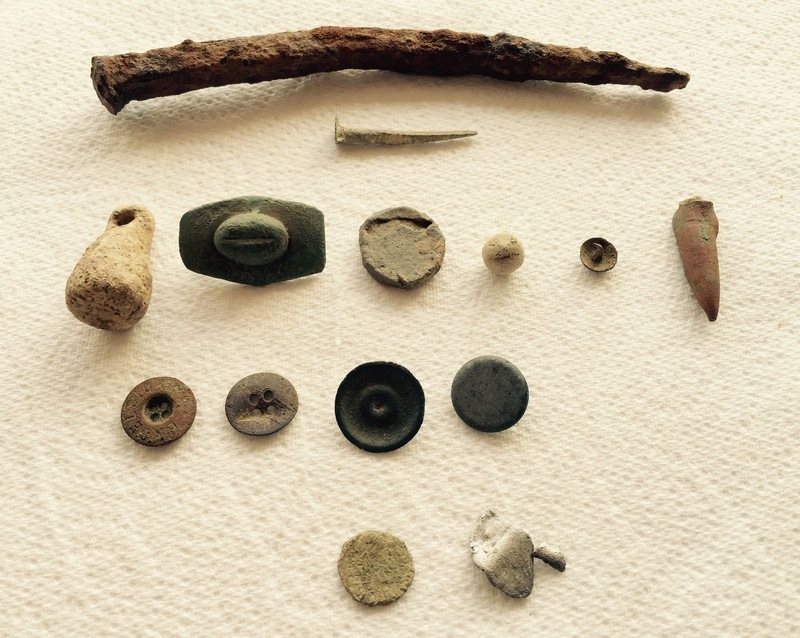 I searched for almost four hours, until after dark, but my detector wasn’t working properly. From the moment I stepped on the field it was on the fritz, spitting and popping, and nothing I changed, frequency, sensitivity, programme, made any difference. 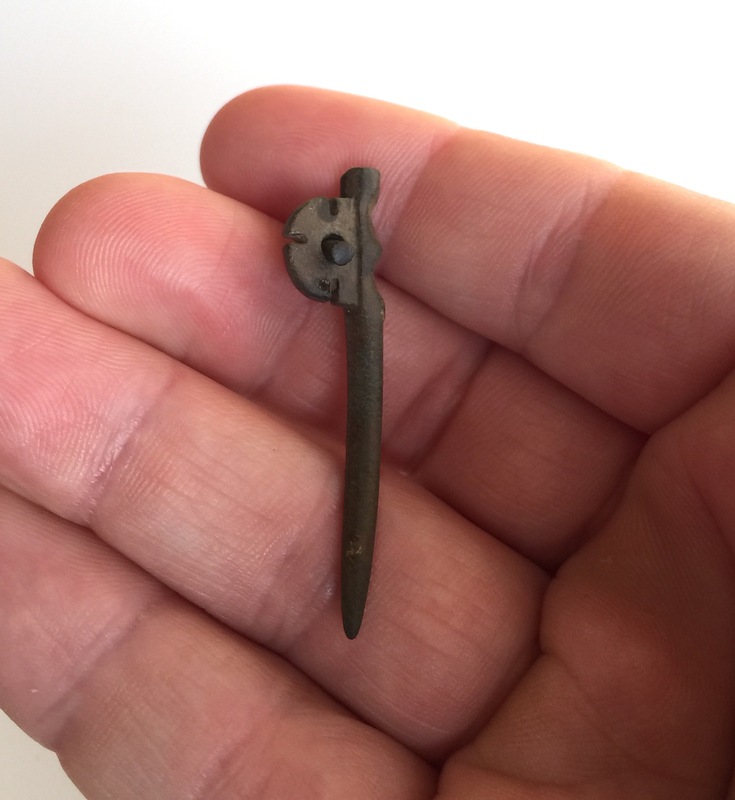 It was maddening to feel that I’d regressed in my ability with the Deus, but no matter how I worked at it, the machine was only finding things on the soil surface. The only recognisable signals gave the rapid double beep of objects lying directly beneath the coil and shallow. 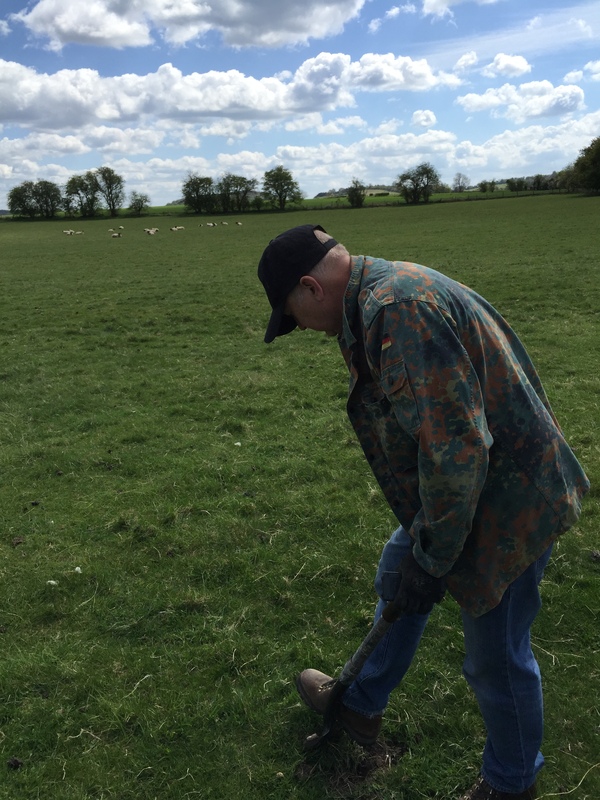 As I walked and fiddled with the remote control, I composed complaint emails in my head to XP, and query emails to various metal detecting fora to request help. How would I frame the issue though? I had no idea what was wrong. It wasn’t until I’d returned home and was lying in bed with the Deus manual (stimulating bedside reading, I know) that I recognised my error — in fact, this was the only time in my life that the ‘Troubleshooting’ section of a manual has actually resolved a concern: I’d committed the cardinal error with the Deus and turned it on near metal. I’d rested the detector on a metal gate while I fiddled with the headphones and turned the unit on. Doing so doesn’t harm the detector, but it messes with the calibration for that session and causes it to function improperly. 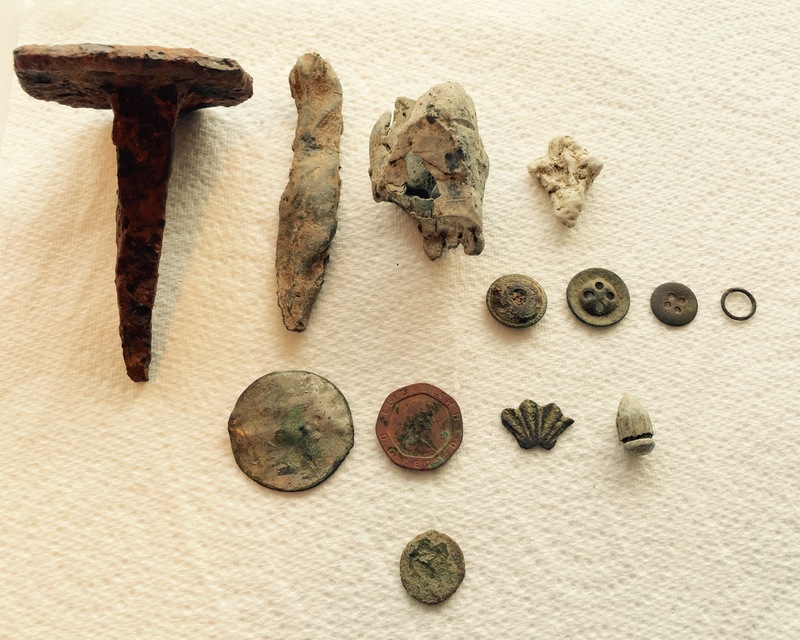 It was amazing that it had managed to find anything at all. The solution would have been the IT Crowd one: turn it off and turn it on again. 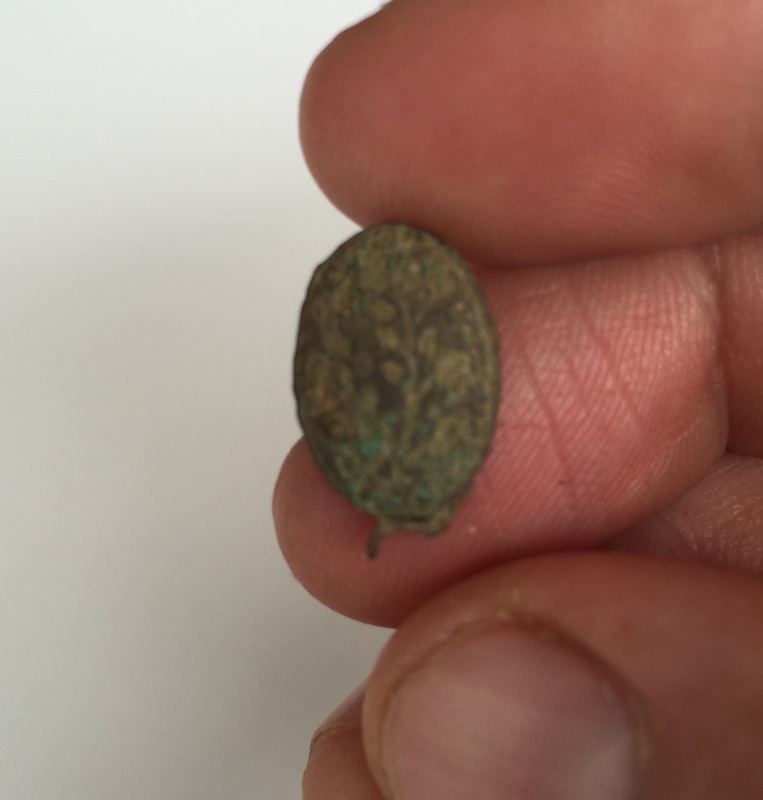 while the smaller floral token (and this one, found just the other day on 4 April) have the same boxed image on the reverse. 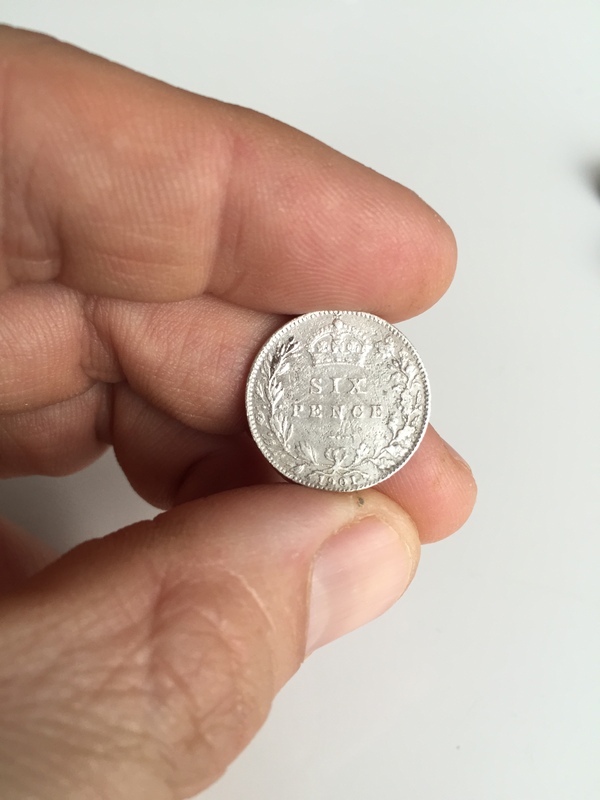 The larger token in the image below has a wagon wheel on the obverse, however, rather than a flower. 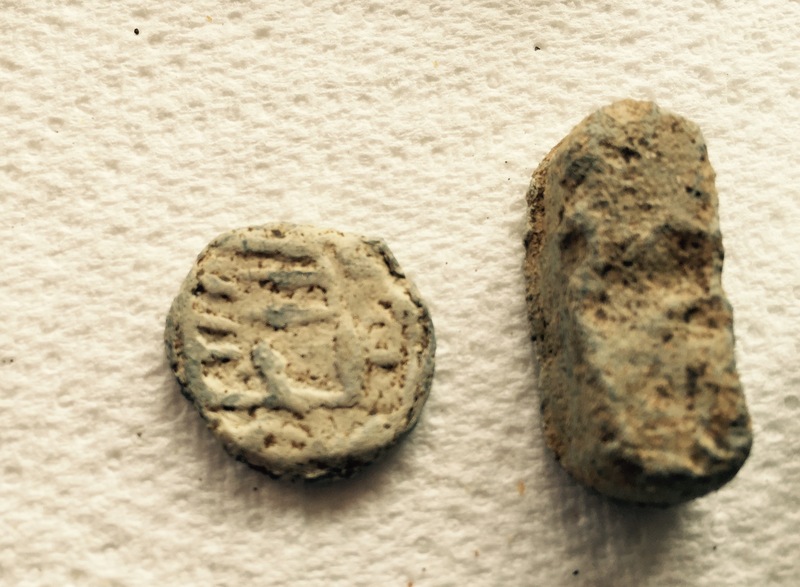 Two ‘floral’ tokens. The far left was found today. 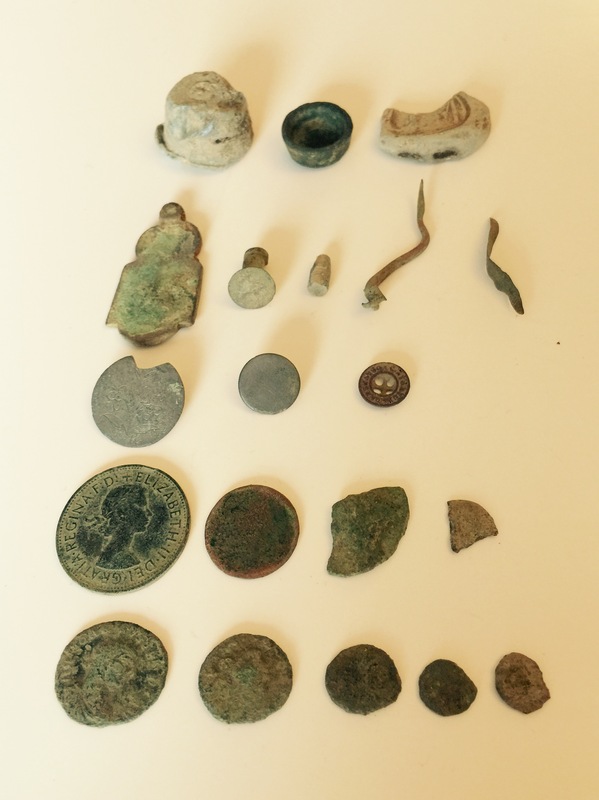 Not bad really for a hunt that went until after dark with a malfunctioning detector (or rather, detectorist). If this is lying on the surface in Noah, imagine what lurks below. 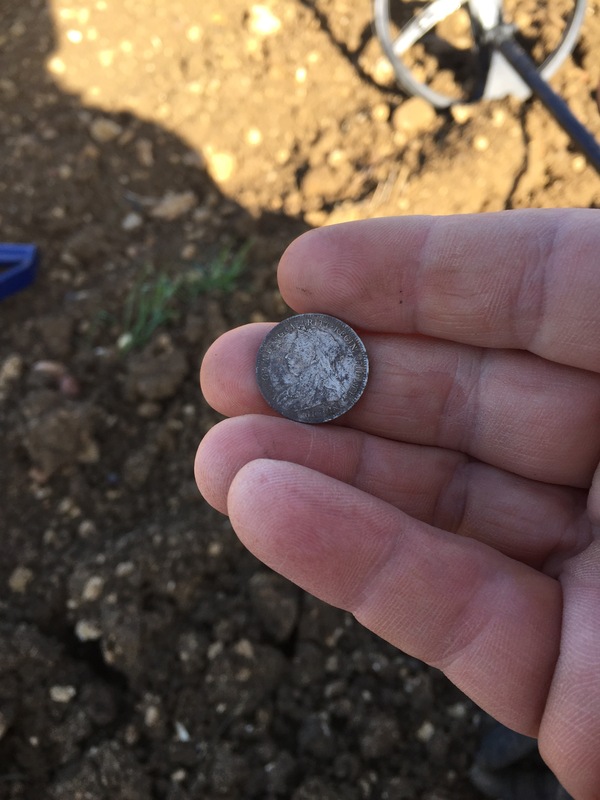 Hammered Lizzie (First Silver with the Deus)! 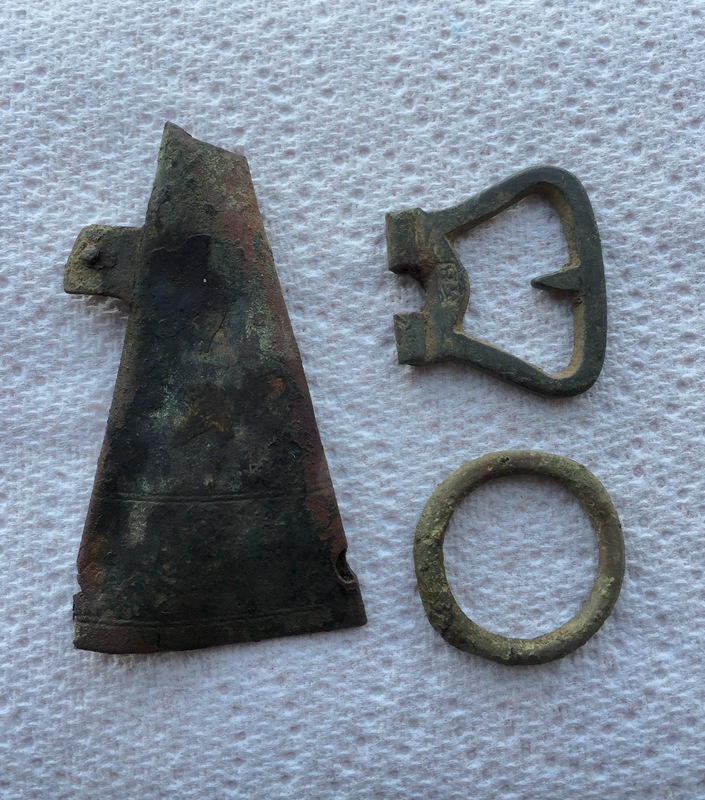 It’s my mom’s birthday today, and she must have brought me luck, because when I sneaked out for a cheeky late-afternoon hunt on Noah field, I found my first hammered silver with the Deus, my third hammy of the year. 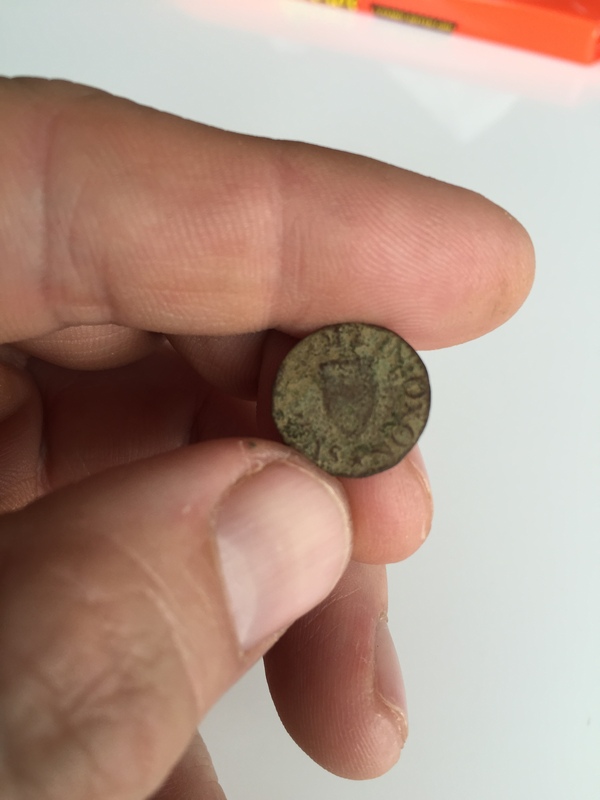 The coin is an Elizabeth in great condition; seems to be a penny (Spinks 2558), but still awaiting a precise ID. 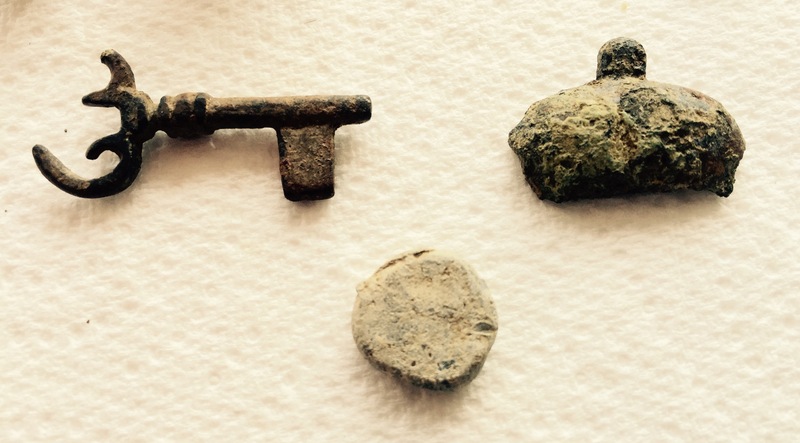 An indeterminate Georgian penny, a fishing weight, a thimble, and two medieval/post-medieval buckles (the larger of which was broken), along with some buttons and lead bits rounded out the haul. 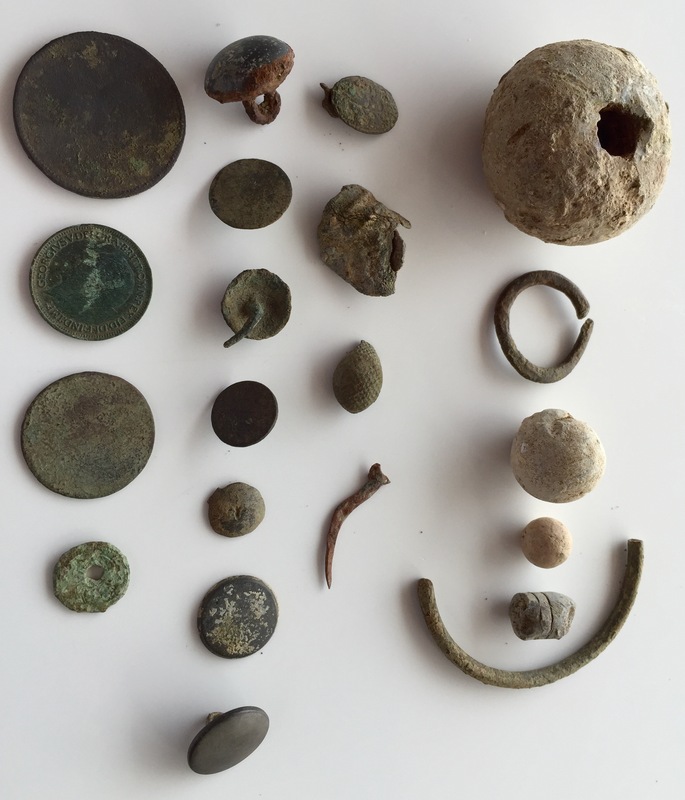 Despite a pressing deadline, I managed to get out with the Deus for a short hunt today. I wanted to try a different configuration, so this time I popped the headset control out of the backphones and into the XP ‘wristwatch’. This connects via a jack to a set of flimsy wired backphones (I ran the wire from the wristwatch up my sleeve to the phones). Although initially skeptical, I loved this setup, as the phones weighed next to nothing (unlike the backphones with the headset control installed), and I soon forgot I was wearing them. The wristwatch allowed me easily to confirm what the audio feedback was telling me regarding the diggability of signals, so I didn’t need the remote control. The Deus was even lighter without it — really like swinging a broomstick over the field. 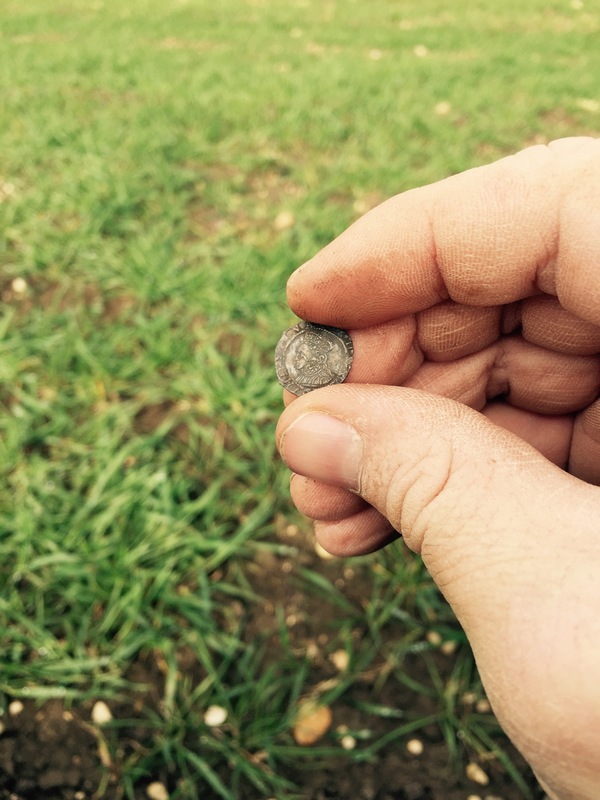 I went back to the spot on Sir Thomas that produced the five Romans on the 18th of March. 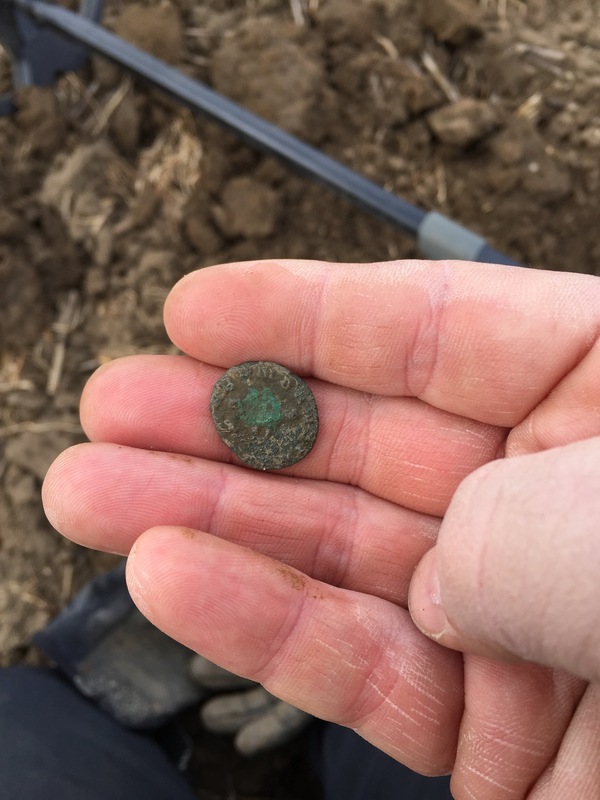 I’d gone over the central section reasonably well with the AT Pro, and I wanted to see whether the Deus could hoover up any remaining Roman coins. It wasn’t long before I had the first one. 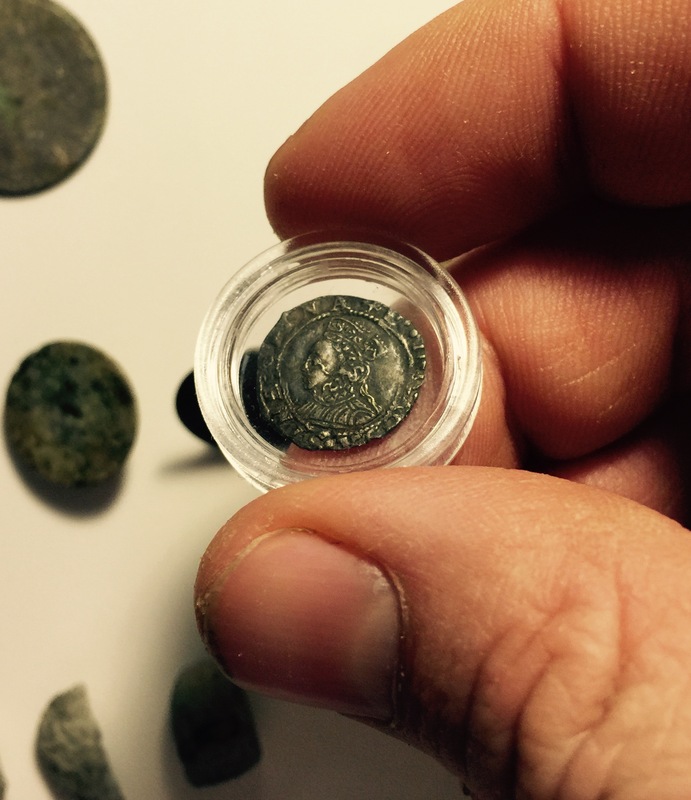 Another, smaller coin (a denarius?) followed just two steps later. At times I found myself swinging the coil ‘low and slow’, like you need to do to allow the AT Pro (or most detectors) its best snapshot of the ground. But the Deus is lightning fast. It has five reactivity settings, and its level 1 setting is as fast as most other competitive detectors on the market. It is a delight to hunt with: I’m confident that if the coil passes over a target (operator error aside), the machine will find the goods. It’s like the Deus is continually channeling George Clooney from The Perfect Storm: ‘I always find the fish!’ (Continually that is, except the part where he fails to find the fish and drowns). 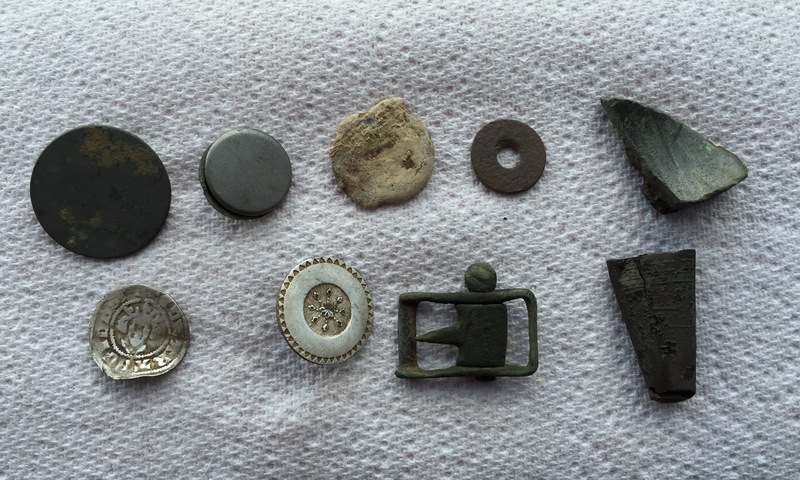 and some buttons, including an almost complete pewter one with a lovely floral design. I couldn’t be better pleased with the Deus. I look forward to trying it out in other configurations and with the WS5 headphones, which arrived yesterday. The WS5s are going to be part of the Deus I am building for my dad’s upcoming visit, so that together we’ll have a full Deus and a Deus Lite.